I’ve been on a serious Mexican food kick the last few weeks and I see no end in sight. Plus, I love that I can pair pretty much any Mexican dish with avocado and salsa, two of my very favorite foods. So how was everyone’s weekend? It was pretty cold and snowy here for the most part on Saturday, so I stayed in and attempted to get some more lifestyle shots for the cookbook. These lifestyle shots are kind of the very last element needed to finish the book and I have been dragging my feet for weeks now. I finally…no my editor finally, decided enough was enough and I needed to get it done. So I set out and worked on them all day Saturday. Glad to report that I got a few that are going to work. I wish I could have finished completely, but I am flying out-of-town today, so the rest is going to have to wait until I get home later this week. Ahh, the never-ending task of creating a cookbook! I heard rumors that some of you in the east are having a little spring weather. I’m currently dreaming of beaches in Mexico, sunshine and temps in the nineties. Anyone on the same page? Maybe that’s why I am craving so much Mexican food lately? Yup, that’s got to be it! Speaking of which, let’s chat about these fajitas that I love so much. I’m just going to come out and say it, this recipe is perfect. It’s easy and healthy and delicious and a dinner that I truly believe almost anyone can love. Well, anyone that eats chicken that is! Although, if you’re a veggie eater, may I suggest swapping the chicken for one can of black beans or chickpeas and then doubling up on the peppers? Because as a veggie loving freak, I think that would be equally amazing. These fajitas have pretty classic flavors. I used my favorite mix of Mexican spices, tossed the spices on some thinly sliced chicken, added some bell peppers, poblano peppers, and onions and threw everything into the oven on ONE sheet pan. Then I roasted everything up until the peppers began to char and the chicken was cooked through. Couldn’t be easier, right? I always, always serve any kind of fajita with a little cilantro lime rice, cheese, pineapple or mango salsa, and plenty of fresh sliced avocado. You could also use guacamole, but I’ve been loving the simplicity of using a simple avocado lately…so delicious on their own! Then just stuff everything into a warmed tortilla and dinner is DONE. And I mean, I know it’s Monday and all, but doesn’t that just make it all the more reason to add a margarita? Think of it as a an pre Cinco de Mayo/End of February celebration. 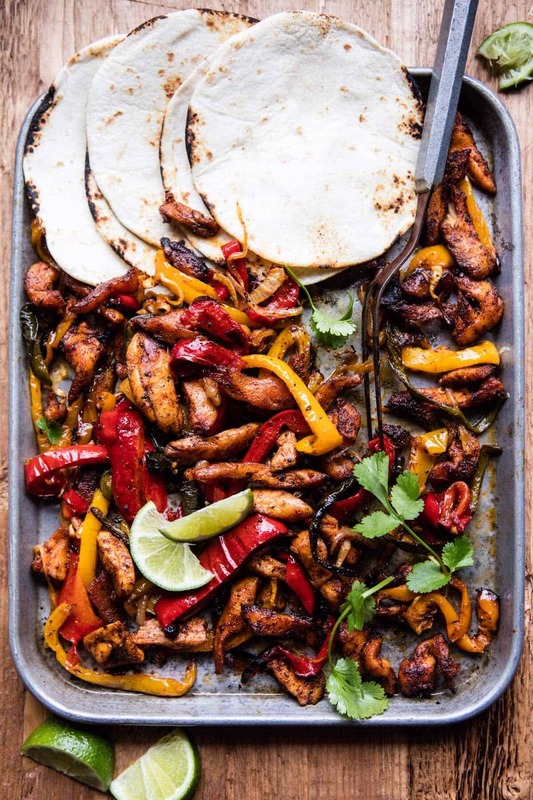 This easy recipe for chicken fajitas is ready in just 30 minutes! 2. On a large baking sheet, toss together the chicken, chili powder, cumin, paprika, garlic, powder, kosher salt and pepper, and 2 tablespoons olive oil. Scoot the chicken to one side of the pan, arranging it in an even layer. 3. To the opposite side of the pan, add the pepper, onions and remaining 1 tablespoon olive oil. Season with salt and pepper and toss to combine. Transfer to the oven and bake for 20-35 minutes or until the chicken is cooked through and the peppers are beginning to char. 4. Remove from the the oven and toss everything together with the lime juice and cilantro. 5. To serve, divide the rice among warmed tortillas. Top with chicken, peppers, cheese, avocado, and salsa. Enjoy! And all the loaded fajitas we can eat. Cheesy Chipotle Adobo Chicken Quesadillas. I didn’t know you could cook with poblanos without peeling the skins. That’s why I’ve never used them even though I love the taste in chili rellenos. Thank you for giving me a recipe I can use them in at last. Absolutely NOM to the max!! 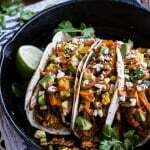 Love Mexican food and eat it often, including many of your recipes. This one looks so easy to throw together-love the char on everything! Will definitely add it into the rotation. I hope you love it Jean! Thank you so much! I do, in fact, need these tonight! I hope you love them, Gemma! Yes it is so easy! Thank you Emily, I hope you love this! THis is a huge coincidence, yesterday we had mexican for dinner, burritos, actually. It was the first time our son tried one and he LOVED IT! So I guess we’ll have to start him on the fajitas and the tacos as well!! Wow that is so great! I hope you like this recipe, Ruth! Super duper love this! I’m kind of a lover of Monday’s anyway so these would be the perfect end to a super day!!!! That is so great & there needs to be more lovers of Mondays haha! Enjoy! 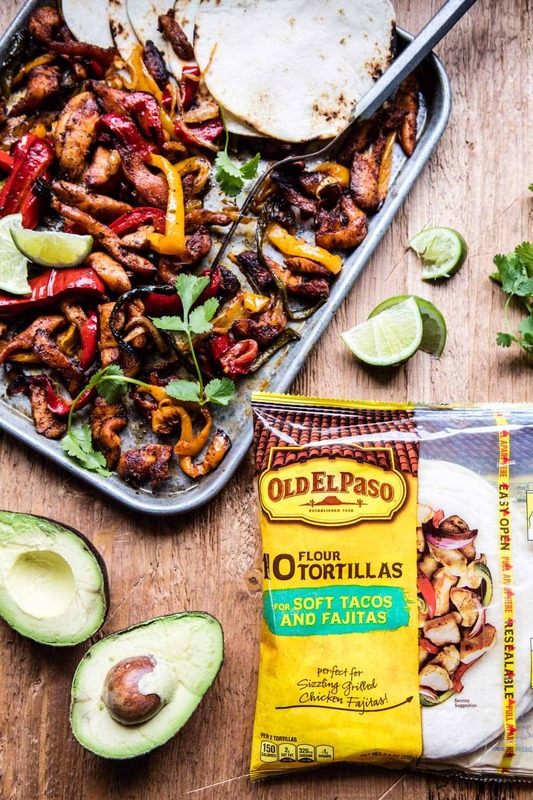 Old El Paso flour tortillas are made with partially hydrogenated oil – this ingredient should be avoided. Please consider the ingredient list when you make product recommendations. Hi Lynn, I am sorry you do not approve of these tortillas. I will ask if they can opt out of using these poor ingredients in their tortillas. I hope you love it, Izzy! Going to make this on Friday! 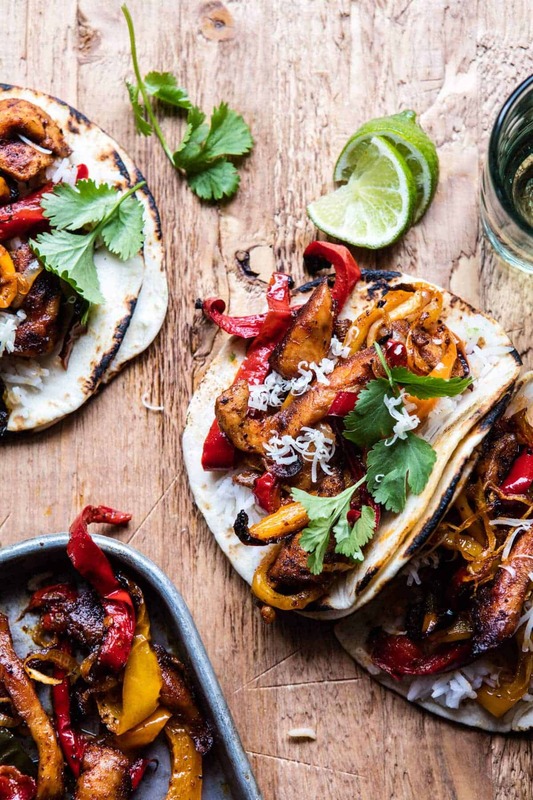 What a great way to make fajitas! I don’t make them often because of that. Thank you — love your site and your recipes! I hope these turn out awesome for you, Mary! Thank you! I hope you enjoy these, Laura! Thank you & let me know how it turns out! Yum! Looks like a perfect weeknight dinner! Old El Paso is literally the best. LOVING these fajitas, Tieghan! Couldn’t be a bigger fan! So happy your liking them Jen, thank you! Looks sooo good! 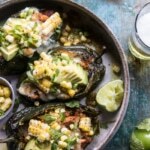 Can I sub the poblano for ancho chile? 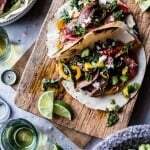 I know that the ancho is the dried version of the poblano but will it really modify the taste? Hmm, I am not sure as I have not tried it. I think it would be fine, but I am not sure how much you will need. i would say maybe 2 teaspoons dried powder? These look delish Tieghan! Love Old El Paso! 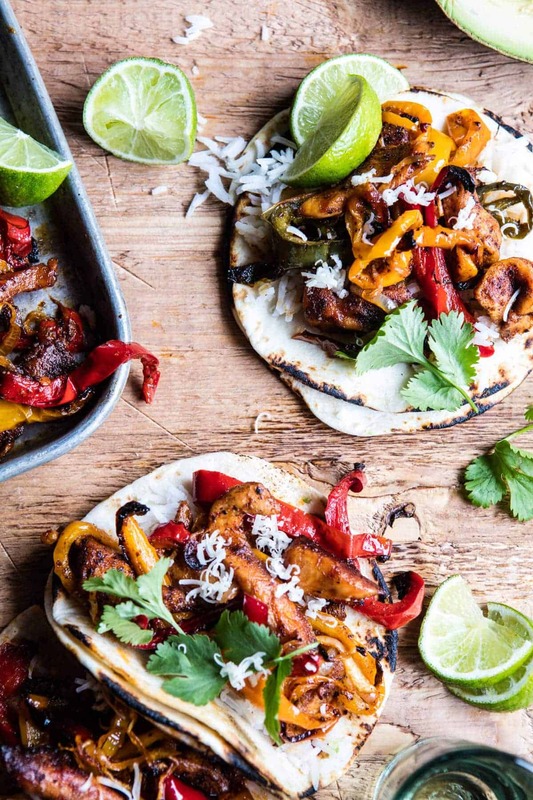 Fajitas are one of our faves. Same here!! Hope you get to make them Mary Ann! TACO TUESDAY IS HEATING UP! Mmm, fajitas! Was just talking to someone how I haven’t had fajitas in forever. Sheet panning them is an awesome idea to keep things easy! Perfect timing!! Thanks so much Gina! I need these like ASAP!!! Hope you love them Matt! Just made this for my family, perfection! SO EASY!! And tastes SO GOOD!! Love these type of quick, weekday dinners! So happy you like it Maria (: Thank you! I made these last night. Hands down, the best fajitas I’ve ever had. I was sooooo proud ! It feels like there should have been so much work put into these since they’re so good. So happy you liked them Susie! Thank you! Okay, made these tonight and they were so, so, so good! This recipe is a keeper. I kind of knew it would be good — so I doubled the recipe! Used tortillas tonight — but with my yummy leftovers I am going to use butter lettuce to go “lighter” during the week. I’m passing the recipe onto some friends! Oh wow! So happy you liked it Mary! Hope everyone else does to, thank you! Made this last night and LOVED it. Pretty insanely easy and fast. Exactly what I wanted to hear!! Thanks for making it Sierra! Fast easy recipe.. Flavors are incredible! Next time I’ll mix in some fresh minced garlic with the chicken before baking and a dollop of sour cream in the tortilla at the end. Cannot wait to make again! Thanks! So happy you liked it Lori! That sounds perfect, garlic is always good! Thank you! This is about the 6th-7th recipe of yours I’ve made and like the others, this one did not disappoint! Followed it to a T and even had leftovers, which were even better the next day! Will definitely pull this one out next time we have company, the colors are beautiful together which makes for a lovely presentation. Thank you (again!) for these fantastic recipes!! That is so amazing to hear! I am so glad you loved this and let me know how it goes at your next party! Thank you Sherry! 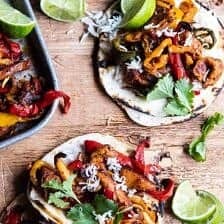 Best and easiest fajitas ever! A new favorite around here! Awh yay, so happy you guys like them! Thanks Heather! A link to a printable page would be nice. “Remove from the the oven…” Spell/Grammar check is your friend! Made this for dinner & it’s a perfect weekday meal. It’s so yummy, & oh so easy! I used chicken tenderloins, so I just had to chop the veggies while the oven preheated. Then I just threw it in the oven and walked outta the kitchen. Served it with tortillas, salsa, & store bough quac (because Mondays). Whole family enjoyed it & I loved how easy it was to prepare! Will def make again! Thank you Calliope! I am really glad you and your family enjoyed this recipe! How do you heat your tortillas? Made it last night and it was delicious!!! Made for a date and it was a huge hit! That is so great! Thank you Porcia! 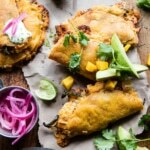 I love poblanos, but I especially love easy recipes! Big fan of Mission Tortillas flour tortillas too. They have the perfect size tortillas. So glad you like this! Thank you Maggie!! Um, THESE WERE AMAZING. And so easy! Thank you. I will be making them again and again. Made this tonight for dinner and it was a hit! Thank you for such an easy and delicious dinner! I’ve gotten several of my mom friends hooked on this recipe because it is just so easy and delicious! It’s a go-to on a busy day over here. I’ve made it with tortillas, as a rice bowl, or even a cauliflower rice bowl. YUM! Thank you so much! I am so glad you enjoyed these fajitas! I do not usually comment, but these were amazing!!! I had no poblanos so I sliced up some jalapenos. I recently made your jerk chicken, chicken teriyaki and my favorite of all, cauliflower pumpkin gratinee. Going to try the sheet pan greek chicken next!! Great! I hope you love these fajitas, Cara! Thank you so much! How many calories and how much sodium? Hi! I do not calculate the calories or nutritional information for my recipes, I just try to use good ingredients. Sorry about this Chrystal! Please let me know if you have any other questions! These were terrific! Quick and easy and delicious! Double the recipe for sure. I am so glad you enjoyed these! Thank you Natalie! These were so delicious I can barely comprehend it. I don’t think my taste buds were ready for something this tasty. Thank you Victoria! I am so glad you like this recipe! These were DELICIOUS!!! Excellent flavor and simple to make. Thanks for the great recipe. Thank you so much Karen! I am so glad you enjoyed this recipe! Sheet pan dinners FTW – I keep this recipe in our rotation! That is so awesome! Thank you!! These were outstanding. I usually use Mission Tortillas, which I’m sure would have been fine, but I have to say that the Old El Paso soft taco and fajita tortillas were a step up! The spices were perfect and the combination of peppers beautifully colorful. 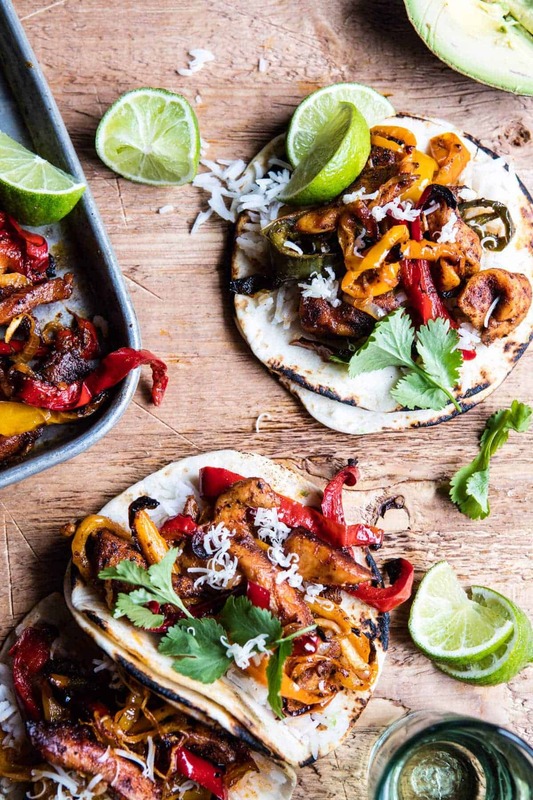 I love fajitas, and these will now be my ‘go to’ recipe. Thanks again. You never disappoint. I have made this multiple times and have sent it to my mom, who has also made it multiple times, and she has emailed it to friends who are also obsessed! Thanks for a fantastic, delicious recipe that feeds me, myself, and I (and my mom and her friends) all week! I am so glad you loved this Hillary! Thank you so much! I love this recipe, especially because it’s a sheet pan meal. What could you recommend as a vegetarian chicken alternative that could still go onto the sheet pan? Your recipes make my partner really happy every week! This is our FAVORITE recipe! The flavors are bold, delicious and addicting. This is our most used recipe! Really great recipe!!! Made for a birthday dinner, they loved it!!!! Making these again tonight- they are just so easy and everyone loves them. I sometimes can’t get a good poblano so I’ll throw in a well seeded jalapeño. The rub on these is perfection! That is so amazing! Thank you Jill! Yum.Yum. Easy and yum. Chicken was done before peppers so I finished peppers and onions on the stove. Big hit at impromptu dinner. Half Baked Harvest Brownies for dessert. This recipe was packed with flavor and so simple to make! I had all of the ingredients on hand and was able to quickly throw it together on a weeknight. I suggest putting the veggies in the oven before you prep the chicken, allowing them to blacken a bit without over cooking the chicken. Thank you so much Jessica! I am so glad you enjoyed this recipe! Wow I am so glad you loved this recipe and I hope you love every recipe you try! Thank you so much! Wonderful recipe! We all loved it and it was quite easy to make. It’s being added to our list of regular meals! I love to hear that! Thank you so much Adena! these are great and very easy! !